A cake is missing from the cake contest, and Detective Duck is on the case to solve this mystery. The clever story and funny puns will keeps my kids guessing and laughing all the way through The Deductive Detective by Brian Rock. "'I heard you crow at sunrise this morning, so you could not have been here as well. So you're free to fly the coop.'" As Detective Duck eliminates suspects throughout the story, the subtraction equation appears on the page, so readers can keep up with Duck's reasoning process. 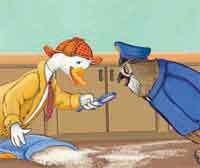 Along with that, Duck uses clues to discover who could have stolen the cake. 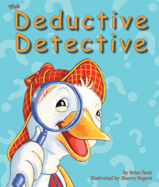 The pacing of the story holds young readers' interest as they try to solve the case along with Detective Duck. This book is especially fun to read aloud, and my kids giggle as I emphasize the plays on words when I'm reading. I like how this book incorporates language arts, critical thinking, and math. "More than a picture book," The Deductive Detective includes activities in the book as well as additional teaching activities, coloring pages, alignment to standards, and more at the Sylvan Dell website.